A true British icon, Burberry is a brand synonymous with the dynamic principles of heritage and tradition, interconnected with the modern sensibilities of understatement and contemporary style. Burberry's core values of tradition, family and relationships are reflected in all that they do, from their classic tailoring to their iconic fragrances. 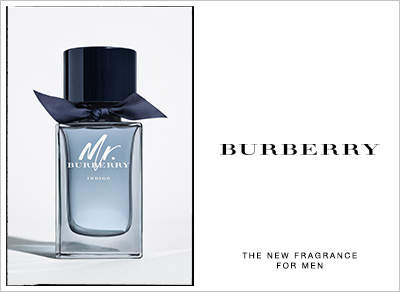 Burberry fragrances celebrate the city of London and define the elegant and modern spirit of the brand. From Burberry Touch and Burberry Brit to the newer The Beat and Body, each scent captures the zeitgeist of style.They exemplify British chic: classic without conformity, elegant without effort. Evoking feelings of intimacy, sensuality and sophistication, Burberry fragrances for men and women represent a timeless relationship. With a reputation as established as Burberry's for fine tailoring and exquisite garments, it's no surprise the brand has such a rich and illustrious history. Its service to fine drapery has been recognised not once, but twice with the Royal Warrant, with the Royal Seal being given by both HM Queen Elizabeth II and HRH The Prince of Wales. Burberry was founded in 1856 by Thomas Burberry, a young man who started his career by constructing outerwear for the sportsmen of Basingstoke. This instigated a great Burberry tradition of outfitting those involved in adventure and exploration. Several prominent explorers were clad in Burberry in the 1900's, from Roald Amunden, the first man to reach the South Pole, to Lord Baden-Powell and Lord Kitchener, forefather of the cub scouts and infamous British Field Marshal respectively. Burberry also created the classic trench coat and the fabric Gabardine, both instrumental in the clothing of troops during the First World War. The Burberry name is as important a talisman to the world's garment history as it is to Britain's, with innovation and constant development an integral part of their prestigious history. The brand's recent renaissance is a testament to their Creative Director Christopher Bailey, whose revivication of the prestige house has moved Burberry to the world's centre stage once more.